Every year in May, the Spoorwegmuseum (railroad museum) in Utrecht holds a Thomas Weekend. 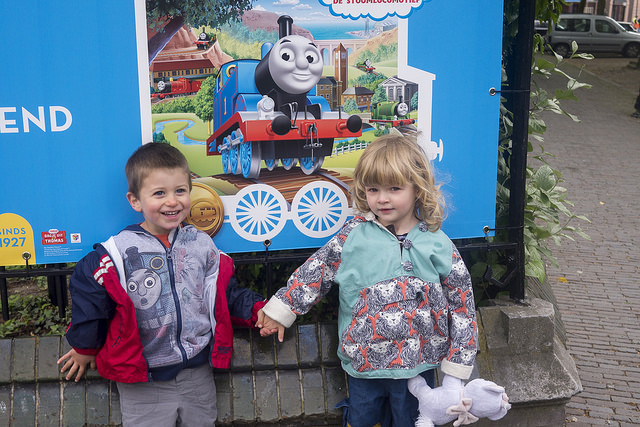 We attended this year for the first time and have a few tips to share if you’re also planning a trip to see Thomas. Two happy kids at the Thomas Weekend at the Spoorwegmuseum in Utrecht. Unless this is the only museum you want to visit all year, buy a Museumkaart (museum card) because entry to the Spoorwegmuseum is expensive — €16 for adults and kids. The Museumkaart costs €55 for adults and €28 for kids (at the time of writing) and gives you entry to 400 museums across the Netherlands. One visit to the Spoorwegmuseum therefore earns you back 30-50% of the Museumkaart purchase price. 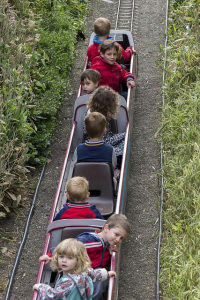 All you have to pay is the €1 supplement for the Thomas weekend and you have the card to use for the rest of the year. Bargain! 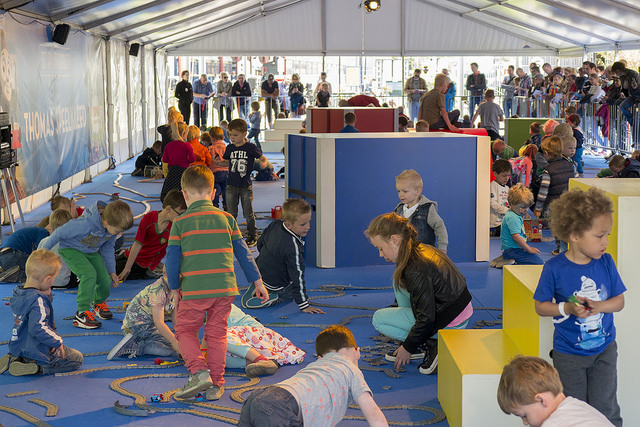 Note: Kids up to and including 3 years old go free and don’t need a Museumkaart or a ticket to the Thomas event. Despite its name, the Thomas Weekend now stretches over an entire week. Normal working days are noticeably less busy than the weekend days. Next year we’ll try to go on a Monday or Tuesday. By lunchtime, it was incredibly busy at the museum. A day out with Thomas is not for the claustrophobic, unless you get there early. For the best experience, you want to be organised. Do everything early! There was no queue for the train ride at 10am. A couple hours later and the whole museum was packed. We bought tickets online in mid-March. The most popular days sell out and we wanted the first available slot (10-11am) on a holiday Thursday (Hemelvaart). The timeslot refers to the time by which you need to be inside but once there you can stay as long as you want. If you need a reminder to buy tickets, you can “like” the Thomas Weekend page on Facebook and then hopefully you’ll see updates from the museum as they appear. Just before the event, the museum emailed us and strongly advised against coming by car. Being the rebels that we are, we ignored them. We did, however, leave home at an unreasonably early hour so that we had a good chance of snagging a spot in the museum car park. We arrived shortly after 9am to an empty car park and killed the next half hour or so by taking pictures by the Thomas signs outside the museum, walking around and peering through the doors. The kids were easily amused, especially because characters like the Fat Controller (Sir Topham Hat) would occasionally come wandering through the car park on their way to the big event. The doors opened a little before the official 10am start time and we waltzed inside feeling smug because we had the whole museum to ourselves. The first hour of the Thomas day was gloriously quiet. In 45 minutes, we were able to take pictures with Thomas and Emily, take a ride on the Thomas Express train, visit the bathroom (always important if you’re pregnant or have a toddler) and get tickets to the first showing of the Thomas musical at 10:30am, all without any queuing. By the time we emerged from the first Thomas musical, around 11:15am, the crowds had doubled. We spent some time in the gigantic play area (a huge playmat filled with trains and tracks) but by lunchtime we didn’t want to be anywhere near the place so we headed out. For us, with two 3-year-olds in tow, a visit of 2-3 hours was ideal. Just before we left for our big day out with Thomas, a friend sent me a note saying that the Thomas Musical was awesome and we should definitely include it in the day. She was right. The kids were totally, completely enthralled and it was a good chance to sit down for half an hour or so. There are three good reasons to pack a lunch. First, kids (at least our kids) need to snack regularly and you don’t want to be continually queuing up for food. Second, you can multi task. When we came out of the Thomas Musical, we found several picnic tables loaded up with colouring sheets and pencils. We could all sit down, eat, colour and rest. Half an hour later we were ready for the next activity. There’s a huge souvenir table set up inside the museum but check prices and consider buying it online once you get home as many prices are inflated. We looked at a backpack but found it for €10 cheaper online. A few things (like the posters) aren’t quite as heavily marked up but you have to be a savvy shopper. Conclusion: We had a great time and would definitely go again. We’d only change two things next time. First, try to go on a weekday and, second, aim to get musical tickets for a slightly later showing. 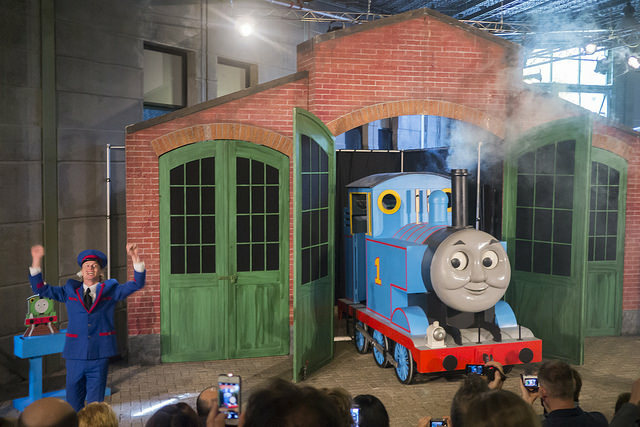 When we went inside for the first Thomas Musical, the museum was still fairly quiet. In hindsight we probably should have let the kids take another ride on the train or do some other activity before the whole place filled up. Finishing with the Thomas Musical would have been the ideal end to our day out with Thomas. Where to find it: Spoorwegmuseum. Maliebaanstation 16, 3581XW, Utrecht.